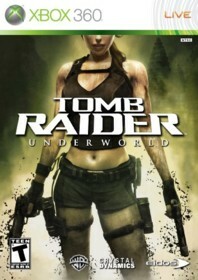 Tomb Raider: Underworld is a Xbox 360 game in the Adventure genre. The game was published by Eidos Interactive and developed by Crystal Dynamics. The game has an ESRB Rating of T (Teen 13+) and was released on 2008-11-18. The game's official site can be found at www.tombraider.com. Tomb Raider Underworld is the direct sequel to Tomb Raider Legend. For those that haven't played that game, the developers put a cutscene summarizing its plot in the extras menu off of the title screen (I'm not sure why they didn't just start the game with the recap instead - it would have made more sense and you wouldn't have to go hunting for it). Anyways, for those that don't know, the basic storyline is that Lara Croft is searching for her mother and wants to determine whether or not she is still alive. This game deals a lot with Norse mythology, so if you liked the story Too Human, you will enjoy this one as well. The controls and camera are more or less the same as those in Legend - which can be both a blessing and a curse as Legend was Eidos' major reboot of this once-stale series. My biggest complaint is with the swimming controls and the underwater camera angles. I can't count the number of times the camera "jumped around" on me and I lost my orientation. Unfortunately, the opening level of the game is mainly underwater - so I was disappointed from the start. Luckily, there is only one more swimming level in the game so I wasn't annoyed too much overall. I also experienced a few cheap deaths while jumping, but this is to be expected in this type of game. The developers also help break up the monotony of solving jumping puzzle after jumping puzzle with motorcycle sequences. During the game I only encountered two main types of puzzles - block puzzles (which were very reminiscent of the classic Legacy of Kain Soul Reaver) and jumping puzzles, the latter relying on simply scanning the environment for handholds and pillars. I found the jumping puzzles rather dull as they mostly degenerated into a game of "find the handhold". Some of these were hard to see as the game is very dark in some areas even with the brightness setting set to full. I felt the story was not focused on enough. Seeing as this is the conclusion to Legend's story arc it should have been given more emphasis. Instead, for every one hour of gameplay you are treated to a very brief one minute cutscene. Some will say this helps keep the game moving at a brisk pace, but I would have preferred a bit more exposition. They also made a very poor decision regarding one of the series major characters - but I will not spoil that here. Overall, the production values were very good and the puzzles, while a little last gen, were fairly fun to work through and the story could have been developed more. Overall, I found this to be an okay entry in the series - but with a bit more effort it could have been amazing.